Old tiles can look at little unsightly but you can really freshen them up with a coat of paint. The problem with ceramic tiles is that they have a very smooth surface. Most paint won't stick to them very well. That will mean after a short while the new paint may peel or flake and they will end up looking worse than before!! So it is particulary important to use the correct product and suitable preparation. Several paint manufacturers now sell paint specially for tiles which which you simply paint on. This will work fine however the choice of colour is limited. 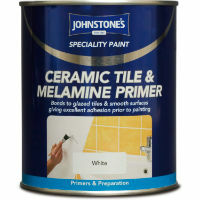 The alternanative, which I prefer, is to use a special tile priming paint first. That sticks really well to the tile surface. You are then free to paint over with any normal paint. This means you are free to use any colour and paint finish. Preparation is very important. Getting a good surface to paint on is vital. Old kitchen and bathroom tles can be grubby with grease or limescale. It's important to remove this with limescale remover and a thorough clean with detergent. Using a very fine sanpaper give the tile a good rub down then rinse and dry the surfaces. On a smooth tiles surface you want to aim for a smooth paint finish. Using several thin coats of paint rather than putting it on thick will give much better results. Give a light sand down and clean after each coat. I like to apply the coatings using a sponge roller AND a brush. A 4 inch sponge roller costs very little and is a great for appying a thin even coat. As soon as you have applied the paint with the roller go over it very lightly with a fairly dry 2 inch brush to flatten down the roller marks. (other wise using only the roller you will get a slight "orange peel " surface.